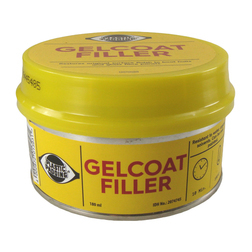 Gelcoat filler kit, suitable for repairing scratches, cracks and holes in gelcoat. For use on both your boats hull and superstructure. Less is more when using the Plastic Padding Gelcoat Filler, it is better to build up layers of gelcoat filler than to try and fill the hole in one go. The less you have to sand the surface layer the better as this can end up damaging the original gelcoat around the repair. 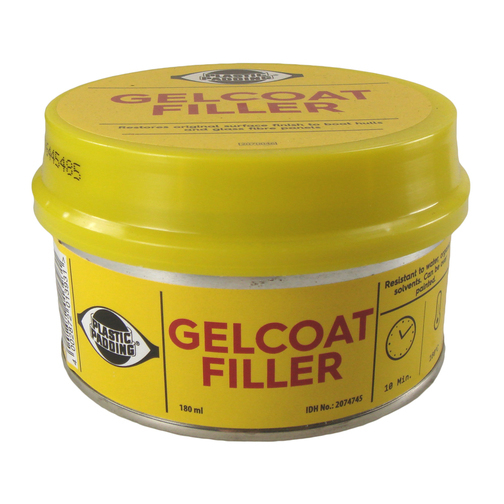 The Plastic Padding Gelcoat Filler kit is suitable for repairing scratches, cracks and holes in gelcoat and enamel. It is for use on both the boats hull and superstructure, the gelcoat kit is easy to use and sets in approximately 10 minutes. The gelcoat filler is white and hardens to a waterproof finish, which can be painted to match the colour of your boat if required. When using gelcoat filler for filling cracks and scratches it is a good idea to mask the area around the scratch before hand (this allows you to sand the finished area without doing too much damage to the surrounding area) and always wear the appropriate safety equipment. Make sure the scratch is clean and dry and apply a thin layer of gelcoat filler to the base of the scratch making sure it gets all the way into the repair. Then apply another layer to bring the repair to the same level as the surface. If the scratch is particularly deep it is better to do this in layers. You can then apply tape to the surface over the repair to keep it flat (particularly useful on vertical repairs). Once the gelcoat filler has hardened, approximately one hour, sand the repair until it is smooth using wet and dry abrasive paper and plenty of water (this helps to avoid clogging the wet and dry paper). If the repair still appears to have irregularities in the surface apply another layer of gelcoat filler as above. Once you are happy with the finish, remove any masking tape around the repair and apply a rubbing compound and finish with a marine polish. For more detailed instructions when using the Plastic Padding Gelcoat Filler please read the guidance sheet included with each pack.